An oft repeated mantra is that something is worth more than it's selling for now, but it's exact full value is unknown. It's as Benjamin Graham said, you don't need to know a man's exact weight to know that he's fat. Along these lines I've been thinking a lot about a concept I will call terminal value. I believe each company has a maximum, or terminal value that is the most it could be worth. A company's terminal value is what they would be worth if their assets could be put to their highest and most productive use. Another way to define terminal value is what a company might be worth if the world's best capital allocator with expertise in a company's given sector were in control of the company and made perfect decisions. I came to think about the concept of terminal value after thinking about valuing companies at a micro level. As an example think about a bank branch. Bank branches are everywhere, on some street corners all four corners are inhabited by branches of different banks. The location of all four branches is the same yet each might have different levels of profitability, why? Why can one branch across the street from another one differ so much in profitability? Why is it that an underperforming branch can suddenly become profitable when the bank is acquired, a new logo hung outside, and new processes and procedures implemented? At a micro level it should be possible to model the perfect bank branch. We could take the best processes and procedures from any bank in the US and apply those theoretically to our example branch. Then we could take into account location and geographic details. All of these inputs would give us the maximum a perfect branch could produce given a certain level of deposits. If this exercise were extended to all of a bank's branches in theory we could create the maximum value of a bank. The sum of these maximum branch values, plus an ideal lending program could be considered a bank's terminal value. Our model creates the most this bank could possibly be worth in an ideal environment. If an investor is expecting a bank to be worth more than a terminal value their expectations are too lofty. Conversely if a non-perfect management team, or non-ideal environment exist then the bank's intrinsic value should be much less than its terminal value. I used the example of a bank and bank branches because branches are easy to understand, and somewhat fungible. But the concept of terminal value isn't limited to banks, I would say in many ways it's more applicable to other business types. Take an example of a real estate company that owns an apartment building. If the company were to attempt to rent their apartments for double the rent of any nearby building they'd have a vacant building. So it's reasonable to assume that there is some value of rent that minimizes vacancies and maximizes revenue at the building. If the company were to keep the building in this ideal state forever that cash flow might represent terminal value. For this real estate company they can't be worth more than this value unless something unusual happens. It seems like many investors build investment thesis on the premise that something unusual needs to happen for an investment to work out. A company with an entrenched management team needs a change of heart. A previously unsalable asset suddenly becomes liquid, an underperforming division suddenly wildly profitable. Something unusual is different than a reversion to the mean. A company can't underperform, or outperform forever, eventually competitive dynamics will either hurt or help the company and push them towards the middle (the mean). The something unusual thesis is expecting that something external to the company, which is unpredictable, and unknowable will unlock value for investors. Unusual things to happen to companies, they are nice surprises that everyone can celebrate. Maybe the real estate company owns a property in a depressed area that suddenly experiences revitalization. While it's nice to experience an external event that unlocks value, it is speculative to base an investment thesis on something unknown and unknowable. What's the practical application of the terminal value concept? I don't expect any investor to build a giant model of the highest and best use for each property a company owns. I think terminal value is a great framework that provides a double check on investment assumptions. If a thesis assumes Warren Buffett's expertise, but instead has Barney Fife as management it's time to scale back expectations of intrinsic value. This framework can also help clarify where we think ultimate value will be derived from. Will it be better utilization of current assets, or something external to the company? 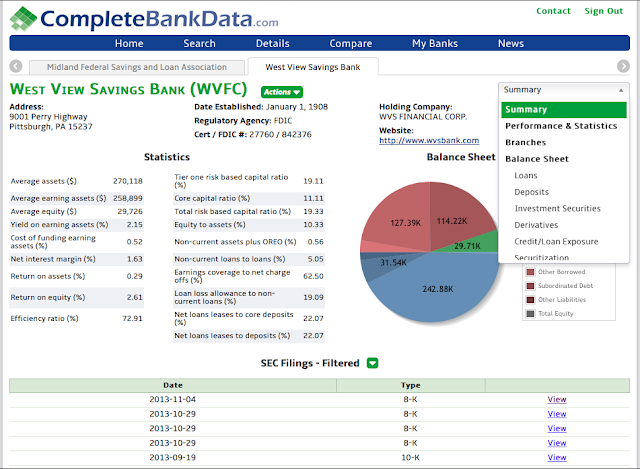 I have a confession to make, when I see a cheap bank I have a hard time not purchasing shares, when the bank is local the shares become irresistible, which is how I ended up owning a position in WVS Financial (WVFC), the holding company of West View Savings Bank. There's something to be said about investing in local companies. It's easier to conduct research beyond filings. I used to live behind West View Bank's headquarters, my evening run used to take me past their building and parking lot. One might argue this is meaningless to an investment, but I'd argue otherwise. After running past their branch daily I had a sense for how busy the bank became on certain days, and could see how well the company maintained their facilities. The biggest advantage though is that their annual meetings are local, in West View's case they hold them at a church about 15m away from where I live. The annual meeting was a great opportunity to meet other like minded investors in Pittsburgh, it also gave me a chance to talk to senior management at WVS Financial and question the board. Unlike my experience at Solitron, the WVS Financial team was open to questions and glad to have shareholders interested in the company. West View Savings Bank was a Pennsylvania chartered mutual savings bank up until the early 1990s. A mutual savings bank is owned by their depositors. When a mutual bank IPO's the depositors are given the option of subscribing to the IPO, in effect they're doubling down on their stake in the company. The bank raises capital in the IPO and shareholders receive the cash they put in, along with the existing equity they had previously owned. It became apparent to me at the meeting that many of the shareholders in attendance were original participants in the IPO. One even going as far as asking the CEO if it was even possible to dispose of shares, to which the CEO told him that he could go down the street to the local Fidelity office and open an account to sell them for $8. 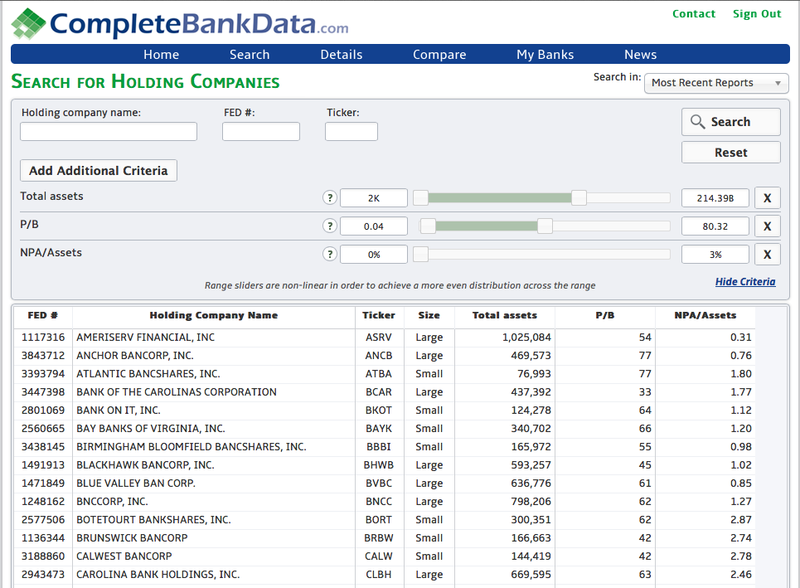 The bank is listed on the NASDAQ, but their listing hasn't attracted much investor attention, shares trade infrequently and were selling at 50% of BV in the past year and a half. The bank is selling for 72% of tangible common equity. They are profitable, and remained so during the financial crisis. The CEO is fanatical about managing risk, NPA's are almost nonexistent, charge-offs are low, lending is extremely conservative. 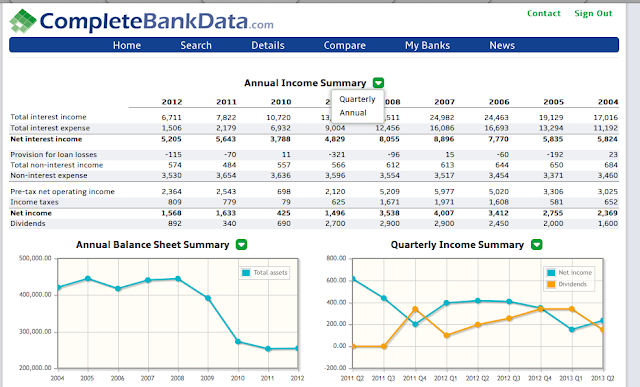 The bank's balance sheet is conservative, most of their assets are in cash and securities, lending is very low. Due to the balance sheet mix if the bank were to grow their lending, or rates were to rise earnings would rise significantly. Two numbers from the above stats are probably sticking out to anyone who invests in banks, the 5.87% ROE, and the 1.63% NIM. You're inclined to stop reading, please bear with me, those figures are low, but there is hope. The bank's loan book has been in decline over the past decade from $61m down to $33m. Couple the lending decline with a decline in interest rates over the same period and it's not a surprise that their NIM has been trending downward. The bank has never been a strong earner due to their conservatism, but even if lending had stayed flat at 2011 levels earnings would be much higher than now. At the annual meeting the company was questioned regarding their lending and their conservatism. Management says they're waiting until rates jump 100bps before they increase lending. Unfortunately there's no telling when this might be, in the next year, or in five years or more. The conclusion I took away from the meeting is that the company has a lackluster lending operation. In a low rate environment they should have been originating loans and earning the servicing revenue where possible. Most of their deposits are interest bearing, but from what management explained at the annual meeting the majority of the interest bearing deposits are in 1-year or shorter CD's paying a nominal amount of interest. If I could summarize my post to this point it would be: West View Savings is a very conservative bank with a poor lending program, solid deposits, and a great branch network selling at a cheap price. The issue all investors ask is whether the price is justified, and what might happen to unlock value. If West View were to never change, then it's possible that 72% of book value is a reasonable valuation. I don't believe it's reasonable because I believe cheap sleepy banks eventually catch the eye of an activist or acquirer. 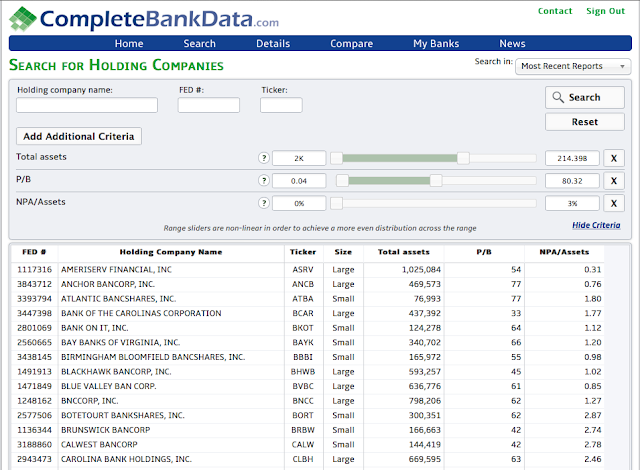 One bank activist who has a small toehold position in the stock is Joseph Stilwell, he owns about 1.5% of the common, not much more than a book mark position. While a stock activist might not be waiting in the wings I think West View is extremely attractive to a potential acquirer. I've spoken to some knowledgable individuals in the bank industry and there are rumors floating that a few regional banks are looking to buy into Pittsburgh. Wesbanco did this recently with Fidelity Bancorp. Fidelity had a similar profile as West View, a great deposit network, but poor lending. 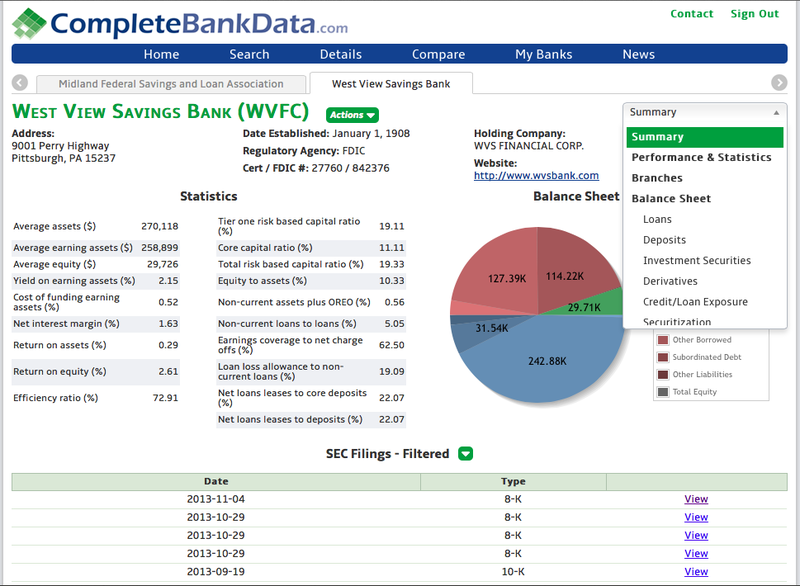 Wesbanco purchased their deposits and placed their own lending program in the branches, the formerly poorly producing branches should be churning out profits for Wesbanco soon. It's possible Wesbanco would be interested in acquiring West View to further expand their presence, or another bank looking to enter the market. 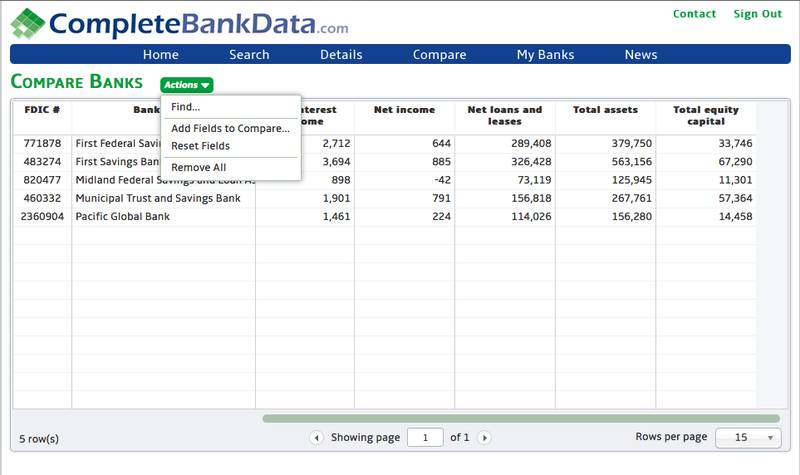 An acquiring bank would see a valuable branch network, valuable deposits, a clean loan book, and inefficient assets. Turning West View's mortgage backed securities portfolio into a valuable loan portfolio is a much easier task than turning around failed assets, or trying to build a brand in a new market. I'm hoping that either West View's current management will be prompted to develop their lending, an activist will get involved, or an acquirer will see value in the bank. I believe in the maxim, but something cheap and maybe something good will happen. I'm also not opposed to working to unlock value myself through discussions with other investors/funds/potential banks/management. Disclosure: Long WVS Financial, open to acquiring more. 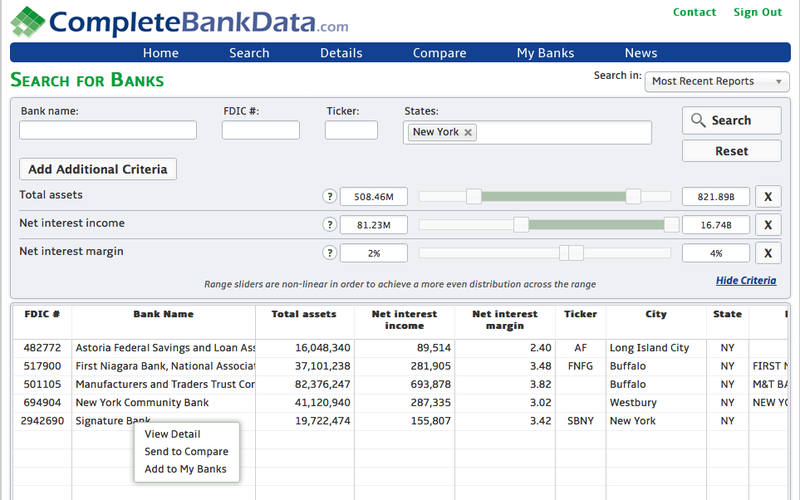 All screenshots are from CompleteBankData.com, stop hunting down call reports, FFEIC reports and building massive spreadsheets, let us do the work for you. Back in January I wrote a small post about a company named Costar (CSTI), the post was fairly concise and to the point. I researched the company and found some things that made me uneasy, the sum of the uneasy items led me to pass on investing. That was when the stock was at $2.02 a share, it trades today at $8.25, and hit $10 two days ago. I wanted to review the investment with the benefit of hindsight, the most cruel type of review possible. Decisions that look sound at the time appear foolish in hindsight, and decisions that were foolish and reckless can appear to be genius in hindsight. The purpose of looking at Costar again is a examine my initial reasoning. If my initial conclusions were made on a sound basis, and because I can't know the future I will be satisfied that even with a missed investment gain that I made the right decision. The reasons I passed on the company were fairly simple, I was worried their profits weren't sustainable, I didn't like that it took them five years to turn the business around, and I didn't like their debt and cash situation. All of those items combined led me to pass on investing in the company at 46% of NCAV. When I wrote Costar up they had a book value of $8m, $203k in cash and $1.4m on their credit line, trailing earnings (9mo) were $.45 p/s. 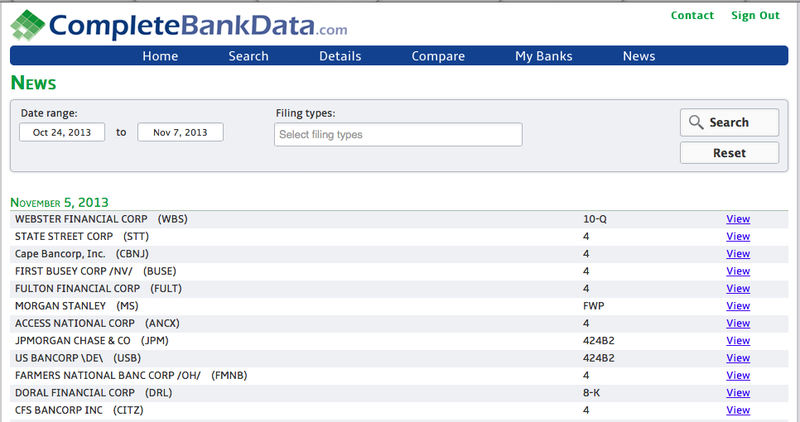 Fast forward to today, they have $2.5m in cash, $10m in equity, no debt, and trailing 9mo earnings are $1.43 p/s. I made a bold claim at the end of my previous post on Costar, I believed they were fairly valued at $2, because I felt their inventory might be overstated, and I was concerned their profitability was a mirage. I had good reason to believe that as well, the company had earned $.45 in the first three quarters of 2012, but in Q3 they were essentially break-even earning $2,000. With the benefit of hindsight I look like a moron, I was worried about earnings disappearing, and instead they more than tripled. There was no way to know earnings would suddenly explode, when I looked at the company they had their first reported profit in years, and then suddenly a quarter later they were operating at break-even again. It appeared at the time that their earnings were temporary, and were back onto a normal declining trajectory. On the earnings front I feel like my decision at the time was the right one. When reviewing my decisions regarding the balance sheet I'm much more mixed on whether I made the right decision. The company reported in 2012 that they had trouble securing a credit line, they were able to secure one from a lender with a high rate, and low underwriting standards. This was a concern, I felt that going to a lender like this was an indicator of the quality of the company. I've had a number of conversations with bankers and small business owners recently that casts doubt on my conclusion over Costar's debt. I've come to find that financing for a small company with the income history of Costar is almost nonexistent at a traditional bank right now. Banks are only interested in loaning a million dollars to a guy with two million in his account. Large banks are lending to large companies, and large companies have no problems issuing debt, but the financing market is still difficult for small companies, especially ones that aren't pristine. My myopia on their lender prevented me from seeing that the company had aggressively paid down debt. Management was serious about eliminating debt and finally did so in the past few months. The cash the company was using to pay off their debt has now started to pile up on the balance sheet. Overall I'm mixed on Costar, if I were to look at them again today as they were in January it's possible I'd make the same decision. If I had known more about the small business financing market I might have cut them more slack. With a net-net the balance sheet is the starting point for an investment, if confidence in the balance sheet is lost the investment is lost. I didn't have confidence in Costar's balance sheet, and while earnings recovered nicely there was simply no way of knowing it would happen. What does the future hold for Costar? I don't know, they earned $.72 p/s this past quarter, annualized that's $2.80 in earnings for the year, for a whopping 40% ROE. Unfortunately one of my key questions remain, are these earnings sustainable? If so then Costar is probably a bargain at these prices, if not then look out below. There seems to be an unspoken (but often implied) mantra in value investing that beginner investors start with asset investments and then once they learn the ropes and grow they graduate to real investment, buying great companies based on earnings or free cash flow. A special few graduate to the highest honors of value investing, special situations, catalysts and bankruptcies. I was attracted to the idea of value investing because it appeared so simple, purchase something for less than it's worth. When I first encountered this it was so obvious, I couldn't believe that everyone in the market wasn't investing like this. Purchasing something tangible for less than it's appraised value is something most of the population can grasp. People will brag about the great deal they got on a pair of pants, or how they purchased a house out of foreclosure and saved a lot of money. Buying an item at a discount to salable value is not a foreign concept to anyone, except participants in the public markets. Market participants will bend over backwards to explain all the reasons a company should sell for less than book, or NCAV. Fortunes are made and lost in the market on a whim. To make a fortune outside of the market you need to either marry the right person, be born in the right family, or most often work hard for sweat equity. I've never heard of a young intelligent person starting a business, and within months turning the little local Carpet Barn into a billion dollar fortune through their raw intelligence, yet these sorts of stories percolate around Wall Street often. A young fund manager can become famous from a single year of outperformance, or a single great trade. For many it appears easy to make money in the market, do some reading, invest and profit. The market's greatest spokesman, and one of the world's richest men doesn't help, Warren Buffett's folksy explanations of value investing are simple, but I feel miss the point. I don't talk much about Buffett on this blog because I'm not sure if there's much to learn from him. This might sound strange to say, but I put Buffett in a class of his own. Buffett is a superstar investor, he is the Ussain Bolt, or Michael Jordan of investing. Are Ussain Bolt's tips on running going to help me run any faster for my Thanksgiving race? Probably not, no matter how simple they are, Ussain Bolt is naturally more gifted than I am. I enjoyed reading The Snowball and Buffett's annual letters, but I don't believe he can be replicated, he's naturally a great investor, I don't have that same gift. Given Buffett's success it's no surprise that there are legions of investors attempting to follow in his footsteps. The problem is his footsteps are unclear, is it cheap stocks like he did in the 1950s, is it his concentration, is it his ability to discern great management teams, or his ability to take advantage of opportunity? Everyone seems to have a slightly different take on what made him successful, and there is no consistent pattern to follow. Buffett most recently has been preaching that investors should be buying great companies at good prices and let them compound. Math is in his favor with a statement like this, it's impossible to argue against buying a company that continually compounds at 15-20% forever at a good or cheap price. The issue is these companies don't sell at low prices often, and when they're priced low it's usually due to an issue or problem they're facing. In my view claiming that the company will come out unscathed and continue on their unrelenting compounding journey is hubris that's often reinforced with hindsight bias. No one knows the future, at best one is making an educated gamble that the future will resemble the past, with the twist that an investor is hoping any issue is resolved without incident. We've lived in an unprecedented age of prosperity in America since the 1940s which has provided a nice tailwind for this style of investing, momentum is hard to change. The mere fact that the world's most successful investor preaches a particular philosophy is reason enough for most investors follow after him prowling around for great businesses at good prices. My view is that just because Buffett does something doesn't mean that everyone else can do the same as him no matter how easy he makes it seem. What I don't understand is the general disdain for asset investing compared to Buffett's growth value investing. The research bears out that simple value strategies like net-nets, or low P/B stocks outperform the market significantly. In the book Quantitative Value the authors make note of a study that showed that if one were to take all stocks at less than 1x book value, short the ones with a low F_Score and purchase the ones with a high F_Score they would outperform the market by a whopping 20% a year. The problem is doing something like this is too simple for most investors. They want a challenge and buying and churning through cheap stocks isn't enough for them. I like to think of value investors who follow in the footsteps of Graham are the antique collectors of the market. We are digging through flea markets looking at old baseball cards hoping to luck on a mint condition Mickey Mantle rookie card. We never quite find that Mickey Mantle card, but we do find a lot of Wade Boggs and Jose Canseco cards which if purchased cheap enough can be flipped for a nice profit. The Buffett school of investing continually visits flea markets until the Mickey Mantle is found. The problem is if one might not know exactly what mint condition constitutes, or how to tell the difference between an authentic and fraud card, and eventually overpay for their Mickey Mantle rookie card. For me investing is a means to an end, it's a way to prudently manage extra savings and grow it at a rate above inflation. When I need the money at some future date I hope to have more, I don't think I'll care much about how I got there, either by net-nets, low P/B stocks, or growing a business. I'm not sure if this post has much of a point, maybe it's really a rant against an attitude I see a lot. My question to you is: "Why so much disdain against a proven investment methodology, that while simple has historically consistently high results?" There is this stereotype image of a value investor being a lone wolf figure, holed up in some library poring over annual reports feverishly looking for investments. Said investor simply reads and generates profits for themselves or their fund. If all it took was a quiet location and lots of reading to be a successful investor the world would be overrun by rich librarians. Fortunately, or unfortunately if you're a librarian, that's not the case. I went to a local company's annual meeting recently, and the number of connections I made coming out of that meeting have had me thinking about the role networking plays in investing. There's an interesting evolution in life, the young think they have everything figured out and have no need to listen to experience of the older generation. They then repeat the same mistakes, learn the same lessons and then try to pass them down to the next generation with the same results. It seems futile, but it's the course of life. I remember being in college and receiving advice from mentors and bosses saying that networking and building connections is what mattered, not necessarily book knowledge. I of course ignored the advice until I learned it on my own. Now I'm sharing the same advice with younger people who ask, and I would imagine they're ignoring it much like I did. Think about any given topic in investing, there are probably thousands of investors with experience investing in that space, maybe a few dozen will write blog posts about it, and maybe one will write a book. Of the thousands of varied experiences the only remembered in a decade will be the ones in the book, or potentially a few blog posts. Yet the experiences not recorded didn't vanish, and in many cases they might be better examples, and better explain the pitfalls and potential than what is recorded. The verbal history isn't visible while the literary history is, what is visible is what's remembered. I feel like there are certain foundational books to creating an investment style, the books explain important foundational concepts, but beyond that for an investor to grow they need to start talking to other investors. It isn't enough to just read a few books, sit in a room reading 10-Ks and invest. The investor who does this repeats the mistakes of earlier generations. When an author writes a book they write it for a wide audience, they write generically. When I talk to someone on the phone (or email) and ask for advice I can share my situation and the person giving advice can give specific advice tailored to my exact situation. Additionally a conversation takes much less time than reading a book or a blog post, and can yield much more information. So how does networking with other investors help? First and foremost you get to meet interesting people. If you put yourself out there as someone who wants to learn and meet new people you will start to make a number of connections quickly. Secondly you might learn a lot about something that you can't learn anywhere else, especially online. There is so much history that's stored up within people and will never be published to the world. If you can make the connections with these people these stories can be unlocked. Don't discount verbal history simply because it's unseen. Another value investor stereotype that needs to be shattered is that all management is promotional and slimy. If you're investing in junior miners in Canada, or Nevada development stage companies this might be true, but I've found otherwise. Of course management is going to talk their book, I'm sure you'd talk your book about your portfolio if given the chance as well. But most likely you're not an expert in the field that the CEO works in. I've had short conversations with executives where I've quickly learned the important drivers and a number of considerations from a management perspective that I'd never seen anywhere else. In the more than three years I've been writing this blog I've probably made about $150 in consideration directly from the blog. What I have made is a great network of friends and investors I can talk to about potential investments, business opportunities, and general career and life advice. If it weren't for reaching out and being willing to talk I would never have the network I have today. A common term associated with net-net investing is liquidation value. In theory a company's current assets minus their liabilities approximates liquidation value, what the company might receive if it were to decide to close down and distribute the proceeds to shareholders. Often a company's accounting liquidation value is not accurate except in cases where a company's assets are mostly cash, they have no liabilities, and management is determined to return the proceeds with as little friction as possible (read: lawyer/advisor fees). A liquidation is where accounting value meets real world value, and a company's balance sheet gets a gut check. 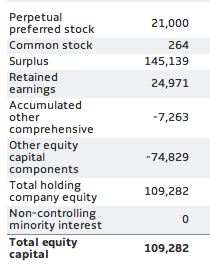 Are the values on the balance sheet accurate? In the public markets companies don't liquidate often, principally due to an incentive mis-alignment. In many public companies management does not own a majority stake, and the company's ownership interest is divided among many diverse parties, that have never had, or will ever have contact. A company's management is incented to keep their job, after all that's usually their only source of income. The company's owners usually don't have enough power individually to force a liquidation, and when they do have enough power management can often work against them eroding value. Sunlink Health Systems (SSY) is in a unique position not unlike many companies on the brink of failure. The company's management needs to work hard to liquidate balance sheet assets to stave off potential failure. As management fights to keep their jobs shareholders are rewarded as potentially undervalued assets are sold for market value. I was first introduced to Sunklink Health Systems through Whopper Investments, he wrote them up as a potential odd-lot tender opportunity. I received their annual report in the mail, and even though I only own a tiny position for a tender I was compelled to browse their financials. Browsing their financials led me to read most of the report as I became hooked on their story. Sunlink Health Systems purchased five hospitals in 2001 with leasehold rights to a sixth hospital. The company subsequently purchased another two hospitals and three home health businesses. The company also operates nursing homes and a pharmacy business. The company currently operates 232 hospital beds and 166 nursing home beds throughout their facilities. The company's hospitals are primarily in rural locations. The health care industry landscape has changed dramatically since the company acquired their facilities in 2001. They went from earning operating profits from their hospitals to sustained losses most recently. Compounding their losses is the fact that the company took on debt to finance their acquisitions, and it's coming due quickly. The company doesn't have the means to raise capital, and with their operating subsidiaries generating losses management has been placed in a tough spot. As a result the company has started to sell off hospitals. Most recently the company sold two hospitals. The first was a 50 bed facility in Southeast Missouri for net proceeds of $7.4m. The company used $5.2m of the sale proceeds to pay down their debt. The company also sold the Memorial Hospital of Adel, located in Georgia for $8.35m last year. They used the net proceeds of $7.5m to pay down debt further. In 2011 the company sold the lease to the Chilton Medical Center to Carraway Medical Systems for a monthly rent of $37,000, and the option to purchase the facility for $3.7m. Carraway Medical Systems operating license for the hospital was revoked by the Alabama Department of Public Health due to their inability to meet financial obligations. Carraway defaulted on their lease to Sunlink. Sunlink tried to re-lease the facility but failed, their lease reverted to the original owner. This property will be a total loss for Sunlink. In 2004 the company sold a medical center in Georgia for $40m in consideration. As of the most recent annual report, the company owned and operated three hospitals, one nursing home, and one joint hospital/nursing home, as well as their pharmacy business. As mentioned above the company is facing two issues forcing them to monetize their assets, they are losing incentive payments for electronic health record conversion, and they are facing a debt maturity date in the next year. As such the company expects to sell three of their hospitals within the next year if possible, and apply those funds to their debt, and use the remainder as working capital. In theory the facilities they are keeping are expected to be profitable in the near future. It's significant that I haven't mentioned anything related to the company's valuation yet, understanding the background is important to Sunlink. The company trades with a market cap of $7.5m, but a better measure of value would be enterprise value, which is $23.3m. The company's book value is $33m, of which $30m is their physical plant, which has an original cost of $64m. The company has $9.5m of debt due in the next year, with $8.7m due shortly thereafter. An investment thesis for Sunlink is fairly simple to construct after building out this story. Are the three hospitals the company plans on selling worth more than $18m? The two hospitals sold in the past few years sold for about $7.5m apiece (net). If that figure holds true for the three latest hospitals the company would be able to pay back their debt and have cash left over to finance working capital. The company is attempting to hold onto their best assets, the profitable pharmacy operations, nursing homes with profit potential, and land that is being redeveloped into a multi-use office park. A simple scenario for what might happen is as follows: the company sells the three hospitals for $7.5m each net of taxes and fees for a total of $22.5m. They pay back $18m in debt and then have $6m available as cash and a greatly reduced liability structure. The company retains their pharmacy segment which is currently profitable, although barely, and the nursing home/hospital that they believe has the best profit potential. An investment in Sunlink works out if the company is able to sell their hospitals for $7.5m or more each. If they can do that then this is a much slimmer company, with no interest payments, and a remaining collection of assets that are profitable, or will be soon. If the company can't sell their hospitals for $7.5m it's possible they will enter receivership. A bankruptcy receiver might sell the company's hospitals, but it's likely shareholder recovery would be much smaller. Investors seem to love lottery ticket investments, and Sunlink qualifies as such. Investors have an additional factor on their side, the company's management is highly incentivized to sell the three hospitals, if they don't they will likely lose their jobs. If they do they will keep their jobs, but also reap the benefits as the share price rises, and their stock options vest. Hanover, still cheap; do changes signal a possible acquisition? In a market that isn't bursting at the seams with cheap companies it's often worth revisiting older holdings that might still be attractively priced. One such company is Hanover Foods (HNFSA, HNFSB), I previously posted on them over a year ago in a series of two posts (post 1, post 2). In the ensuing year the company has continued to perform as expected yet the stock price has barely budged. Additionally one of the largest items holding potential shareholders back from investing has been resolved. Hanover Foods is a vertically integrated food manufacturing company. They grow vegetables in Central America, ship them to the US, process them, package them and ship them to grocery stores. Hanover's brands are distributed mainly in the Eastern US. Readers who live in the East would probably recognize their frozen food packaging with a little dutch boy next to the logo. The company's business hasn't changed since I last posted about them, they are still producing frozen vegetables, snack food, and frozen meals. As seen above the company is clearly cheap, I would consider them one of the cheapest companies I'm familiar with in the market right now. Of course with cheap companies, there is always a reason they're trading at a low valuation. Hanover's Board and executives were involved in a messy legal battle before the company delisted in 2004. The founder's grandchildren inherited the business, but couldn't agree on how the company should be run after their father passed away. John Warehime, the oldest son took the reigns of the company by controlling the family voting trust. John tried to vote himself excessive pay packages and perks, which his siblings vehemently disagreed with. The ensuing legal battles left the family shattered, the siblings haven't spoken in years. Through the family voting trust John Warehime had a complete lock on the company. The voting trust was a strange creation, the trust 'owned' a number of B shares, which are the shares with voting rights, yet according to the company's auditors the trust B shares held zero economic value. That is if the company were to merge with another company the trust shares would essentially disappear. The voting trust also ensured that no activist shareholder could ever gain control, or significantly influence the company, a major hurdle for value realization. A company is eligible to delist when they have fewer than 300 (potentially 1500 with the JOBS ACT) shareholders. The company is considered 'private' in the eyes of the SEC, even though shares continue to trade on the over the counter market. Reporting requirements for dark companies vary and are determined by the state of incorporation. Some companies continue to send quarterly releases and annual reports, other companies shut down all reporting whatsoever. Hanover was in the habit of mailing quarterly financials and an annual report, although this year they skipped a quarter. The financials they send are functional, but they don't contain any management commentary about the business, any business changes are to be inferred from the notes, or other subtle clues. This year's annual report contained two giant surprises for shareholders, the first was that John Warehime stepped down as CEO and his son took his place. The second change was included in the notes, the company wound down their ESOP and voting trust. Additionally for the first time since going dark the company reported the number of shares authorized and outstanding in the annual report. If you go back to my previous posts I spent a lot of mental energy trying to calculate the number of shares outstanding, this is no longer necessary. I can't overstate how significant these changes are. Neither is more important than the other, but together, with the addition of additional disclosure in their annual report I get the sense something is changing at Hanover. The elimination of the voting trust potentially removes the voting lock that John Warehime had on the company. It's anyone's guess who the largest shareholders are at this point since the last proxy for the company came out in 2004. I have heard through sources that Michael Warehime, John's brother, has been selling down his stake over the years. Until someone sues the company in Pennsylvania for a shareholder register this item might remain a mystery. The problem with Hanover is almost every investor who looks at the company recognizes there is value, but most believe the value will never be unlocked so the investment isn't worth a spot in their portfolio. I believe that value is always realized given a long enough time frame, and I hold out that hope for Hanover, and the hope the time frame isn't too long. Fortunately the recent changes have simplified the ownership structure, and opened the door for a potential activist, or acquisition. What might an acquirer see in Hanover? They would see a brand name food company selling at a very depressed valuation. An acquisition at book value might seem like a stretch to some readers when compared to the company's earning power. What they're missing is that the company's earnings are artificially depressed due to a transfer of wealth from Hanover's customers to their executives. Executive compensation isn't broken out explicitly, but based on the note detailing the company's golden parachute it's reasonable to estimate that numerous executives are earning at least a million dollars a year or more. If a company were to acquire Hanover and pay the golden parachute they could instantly unlock a 20-30% earnings gain on the back of reduced executive compensation alone. Add in synergies and suddenly an acquisition at book value starts to look like a bargain. The obvious question someone might ask after reading this far is: "what are the downsides?" The company has a significant amount of debt as of the annual report, mostly related to inventory financing. There is also a single line in the notes that states that the company tripped a covenant, but the bank waived it. It's hard to imagine how such a strong company could trip a debt covenant. My guess is one of their subsidiaries tripped the covenant, and any trouble at a subsidiary is masked once consolidated with much stronger subsidiaries for reporting. I'm still bullish on Hanover, and just as exited as I was when I first found them over a year ago. Except with the recent changes at the company it appears gears might be in motion that could potentially unlock value sooner rather than later. I always have my eyes out for shares of Hanover when they come on the market at the right price. Shares can be hard to obtain, but patience is rewarded. Disclosure: Long Hanover, actively buying if the price is right. One of the great things about being a bank investor is that banks are all very similar. They all make money by participating in the same activities, and they fund those activities by similar methods of funding. The advantage for investors is that once you understand how to analyze one bank there are suddenly over 1,200 traded banks that can be compared. The disadvantage is that since most of these banks are similar there are few rarities, and often rare situations can be bastions of value. Ameriserv Financial (ASRV) is a bank holding company located in Johnstown Pennsylvania. Johnstown is about an hour east of Pittsburgh, where I live. The common stereotype of Pittsburgh is that it's a dirty, smoggy, industrial city laden with manufacturing. The reality is that manufacturing left Pittsburgh in the mid-1980s and since then the city has cleaned up. The main industry here now is finance (PNC), education (Pitt & Carnegie Mellon), and health care (UPMC & Highmark). While the industrial stereotype has moved on from Pittsburgh it still fits Johnstown. Johnstown has a legacy of steel manufacturing, railroading, and other heavy industry. A lot of the area's steel mills shuttered around the same time they shuttered in Pittsburgh, but Johnstown unfortunately never recovered. It's in this setting that Ameriserv is located, they are headquartered in Johnstown, and have branches throughout the area. The bank is fairly unique in the sense that their workforce is unionized. Out of their 374 employees 188 belong to the Steelworkers Union. According to the company there are only ten unionized banks in the country. A unionized staff comes with collective bargaining, the current contract expires this month, although that's worrying the bank hasn't had a work stoppage since 1979. 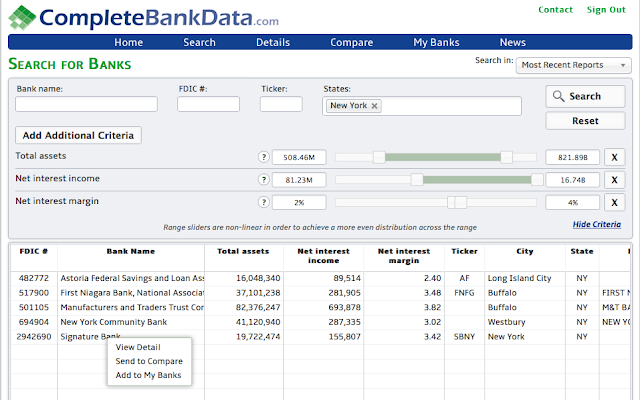 The bank takes advantage of their union connection with information on their website decrying Wall Street and other large banks. They consider themselves a Main Street bank that's helping to create union employment in their area. As a result of their strong union connections the bank's trust subsidiary has specialty union services, and manages $1.5b of Steelworkers money. While it's always nice to learn about interesting companies that's not the ultimate purpose of this post. There are a few aspects of Ameriserv that make it a potentially compelling investment. Relatively high equity to assets ratio, they are well capitalized. Two strong subsidiaries that provide ballast to earnings in this low rate environment. A valuable asset management firm that could be worth up to 50% of the current market cap. The first thing I noticed is that Ameriserv is in the middle of the pack regarding the yield they generate from their earning assets. This means they have a fairly average loan portfolio, and considering the low rate of non-performing assets this is good. What is not good is their funding cost, they have a high funding cost. The majority of the bank's deposits are retail non-demand deposit accounts which is why their cost is so high. Of the bank's $840m in deposits $680m is interest-bearing. The bank doesn't have any brokered deposits which is good, brokered deposits are one of the costliest types of deposits. The second item that caught my eye in the comparison is Ameriserv's high efficiency ratio. A bank's efficiency ratio is a measure of their non-interest expenses to revenue. It's calculated by dividing a bank's non-interest expenses by their total income, both interest and non-interest. A lower efficiency ratio is better, an easy way to think of the efficiency ratio is an inverse gross margin. If you subtract the efficiency ratio from one you have a gross margin for the bank. The largest non-interest expense for Ameriserv is salaries, which is not surprising, banking is an asset-lite service business. Instead of reducing costs many banks try to outgrow a low efficiency ratio by growing deposits and lending. In the current low rate environment that's difficult and often banks are resorting to cost-cutting as a way to increase profits. In Ameriserv's case cost-cutting will be hard because of their union employees. In general Ameriserv's bank is nothing more than an average Mid-Atlantic bank. They have a healthy loan portfolio and a low level of non-performing assets. The bank doesn't hold excessive OREO (Other real estate owned), and they're profitable. Overall there isn't much of a reason for Ameriserv's bank to be valued at less than their tangible common equity, which is $76m. The holding company owns three subsidiaries, Ameriserv Bank, Ameriserv Trust & Financial, and a life insurance subsidiary that I couldn't find the name of. The asset management subsidiary has $1.5b in AUM that generated $7m in revenue and $840k in profit last year for the holding company. As mentioned above the company is deeply affiliated with unions, and their asset management company is no different. Most of the firm's AUM is union pension funds, which is somewhat of a niche business. The asset management subsidiary's earnings are passed through to the holding company, meaning there is no hidden value with their earnings stream. The value lies in what the firm might be worth apart from Ameriserv. Based on their revenue and assets last year they are charging .47% of assets in fees. Typically asset management firms are valued as a multiple of AUM. I spent a long time searching for the number, but was only able to find a range from 2% of AUM to 7% of AUM as a valuation guideline. If we use a conservative range of 1%-3% of AUM the asset management subsidiary alone could be worth $15m-45m. Given that the company's market cap is only $59.7m, this is significant! The trouble with a sum of the parts for Ameriserv is figuring out how the value could be unlocked. It's unlikely the bank would sell, integrating a union with a non-union workforce would be problematic, especially because Ameriserv derives so much of their identity from their union roots. Separating off the asset management firm would be much easier. The company could spin it off as a separate company, or could sell it to a larger asset manager. The company's asset managers have expertise with union assets, but that expertise could travel, along with the relationships to a company like Vanguard, which is similarly priced, and also located in Pennsylvania. Ameriserv is a unique niche bank, and while their banking operations are pedestrian they have a valuable asset with their asset management subsidiary. If the market were to recognize the true value of both of these companies Ameriserv's market cap could be anywhere between 58%-108% higher than it currently is.